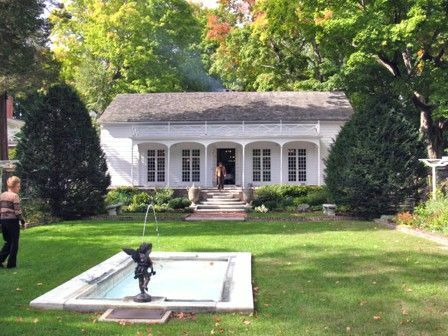 In 1907, Cass Gilbert purchased an early eighteenth-century building, known as Keeler Tavern or the Cannonball House, in Ridgefield, Connecticut, to use as a summer home for the family. Gilbert improved the house and added more buildings during the next few years. 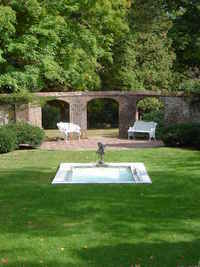 The most notable addition is the Garden House, built in about 1915, and its adjacent terrace and garden, also designed by Gilbert. The Garden House is a large one-story wood-frame pavilion with wood siding and a hipped roof clad with wood shingles. Access is through French doors on three sides that open onto a brick terrace which is sheltered below a projecting roof carried on slender wood columns. Marble steps flanked by antique Italian urns lead from the terrace to the walled garden and reflecting pool, accented by an antique Italian fountain. The interior of the garden house has more the appearance of a ballroom than a garden pavilion with its twenty-foot high ceiling accented by crown moldings, chandeliers, a fireplace, and polished wood floors. The Gilberts' daughter Emily sold the property in 1957. It was subsequently purchased by the Keeler Tavern Preservation Society in 1965 and opened to the public as the Keeler Tavern Museum. National Register of Historic Places, Nomination Form for Keeler Tavern (Cannonball House) (1982) Text: http://pdfhost.focus.nps.gov/docs/NRHP/Text/82004345.pdf (PDF), Photos: http://pdfhost.focus.nps.gov/docs/NRHP/Photos/82004345.pdf (PDF).